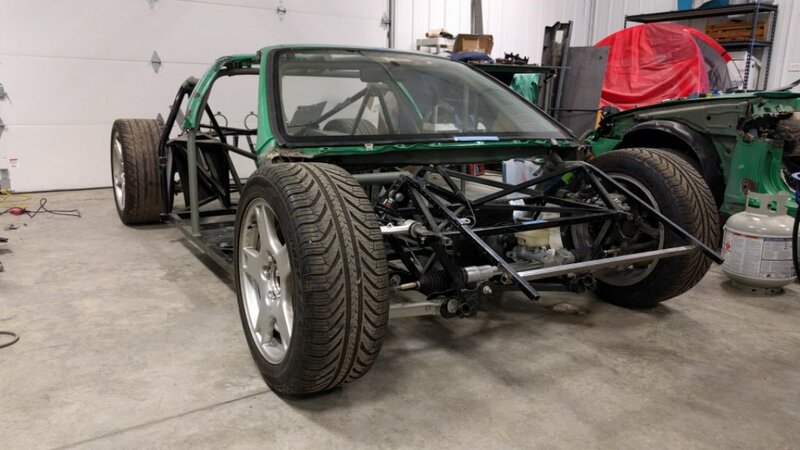 I really got started on my GTM build a little over a year ago, some planning occurred before that. I knew that the FFR kit was a great basis to build into my ideal car. Initially I thought this would be a few tweaks here and there (dropping the nose, shortening overhangs, improving front airflow, improving driver position/forward visibility, etc), but I kept wanting more. 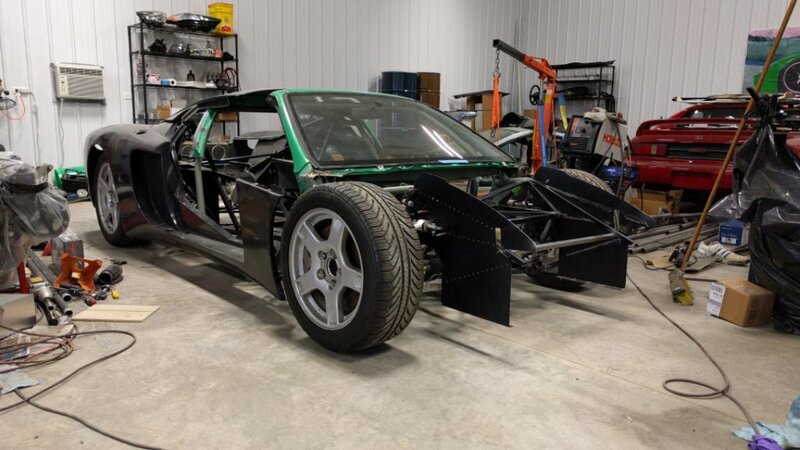 This build is not meant to be disrespectful to the FFR GTM design. It is a beautiful car. I simply felt that I PERSONALLY wanted something in the spirit of the GTM but with some personal modifications for comfort, aesthetics, and even a couple areas that I feel will improve performance (both driver and vehicle). There have been twists and turns and wasted months along the way. I'm at the point where I am sure of the plan and am inching my way towards that goal. Still a lot of work left, but it has become more enjoyable now that I am not going in a bunch of different directions and 'spinning my tires' trying to figure out some tough decisions. I'm open to advice and criticism. My day to day occupation has nothing to do with cars, machines, or anything of that sort. 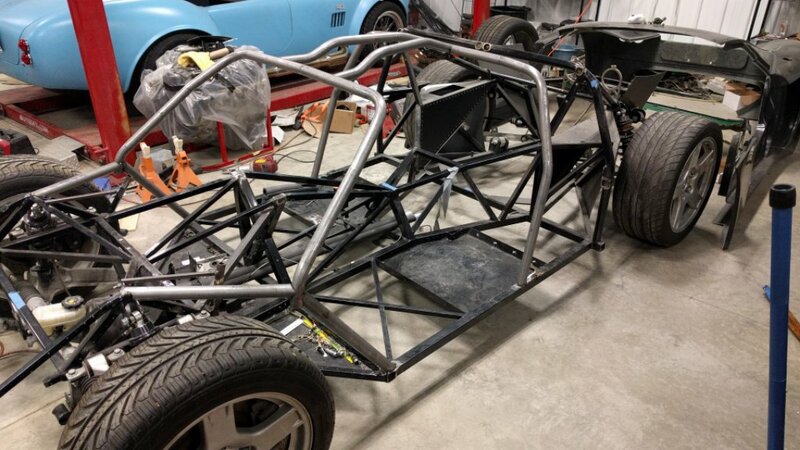 I did build a FFR roadster prior to the GTM. I have a passion for cars and am self-taught in this arena. I started simple, removing a few pieces that didn't fit my build plan. Then I decided the footbox had to be moved, so I cut out the pedal box. Last edited by beeman; 01-18-2017 at 09:56 PM. 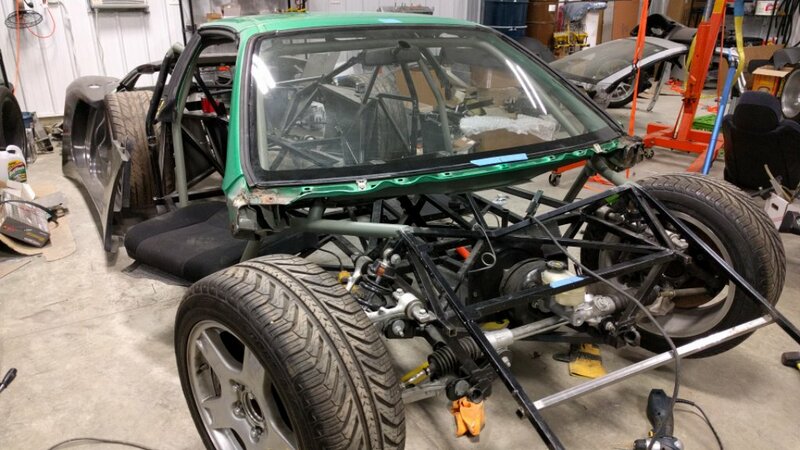 The concept was to keep the GTM chassis but find a suitable OEM donor cabin. 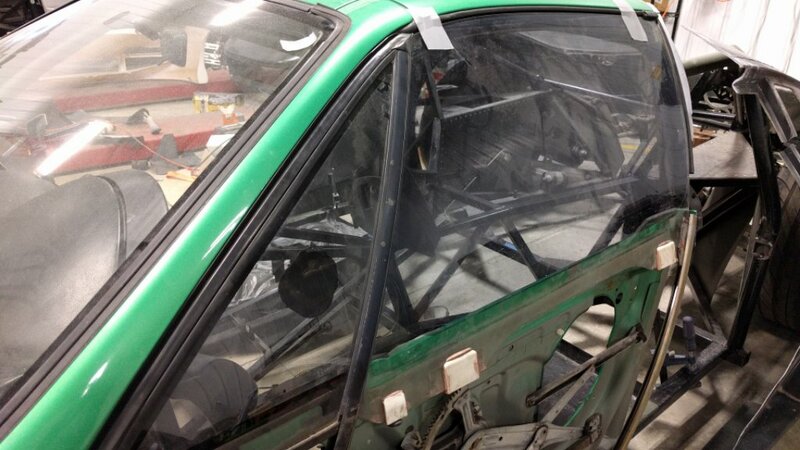 OEM windshield, OEM quality side windows that seal when you roll them up. And some way to drop the top on sunny days. I wasted a lot of time going back and forth between the 2nd generation MR2 with t-tops and an 03 Celica with a power moonroof. Both had sleek designs but both had flaws when applied to this project. Last edited by beeman; 01-18-2017 at 09:55 PM. I had to move the foot box forward and create a new firewall. 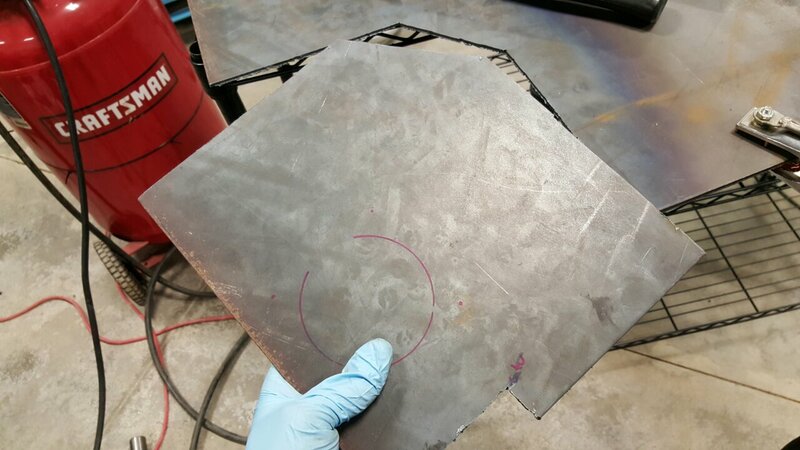 I utilized 1/8" steel plate for the firewall. I incorporated modified Toyota pedals, converted from OEM hanging style to floor mounted. 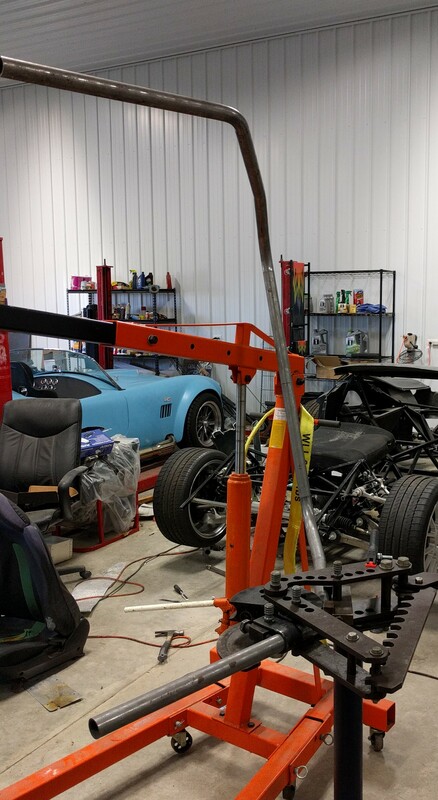 Utilizing C5 Corvette brake booster/master cylinder, Toyota 5/8" clutch master cylinder, Corvette fly by wire gas pedal converted to floor mounted. 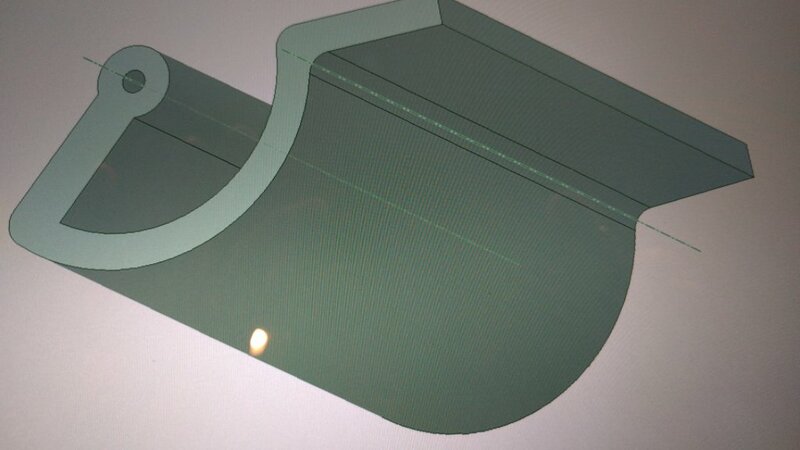 Driver footbox extended with sheetmetal into tunnel area, cooling lines will run outside the car similar to the 818. 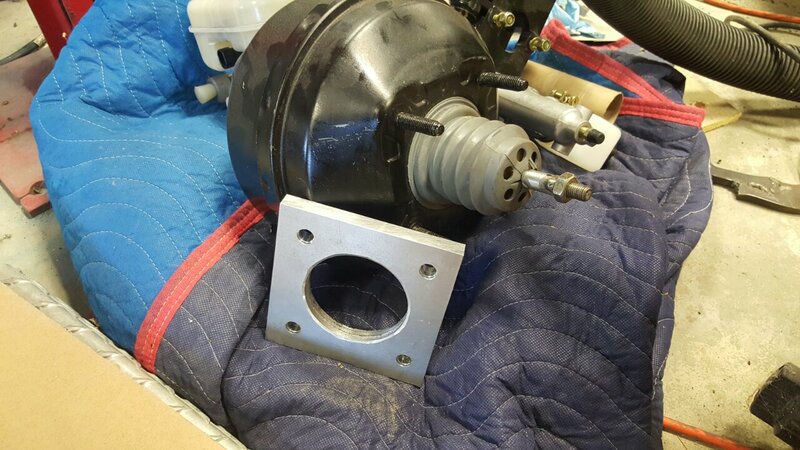 Corvette booster with shortened piston rod, fashioned a 1/2" aluminum spacer. Last edited by beeman; 01-19-2017 at 08:17 AM. Pedals moved quite a bit forward, but remain well behind front axle line. Borrowed some space from within the rear lower control arm mount ears for the clutch pedal mount. Booster looks crooked, but is in line with driver right foot axis. Plenty of room for my size 13's. 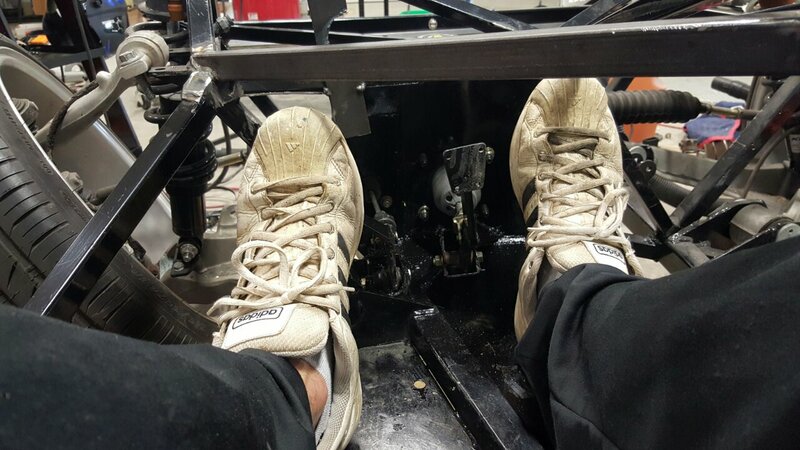 Floor chassis rail between the brake and clutch is in a great location, not even noticed in driving position. Last edited by beeman; 01-19-2017 at 08:20 AM. Finally bought a tube bender this past August, should have bought it sooner. In August, I found a donor that finally worked. 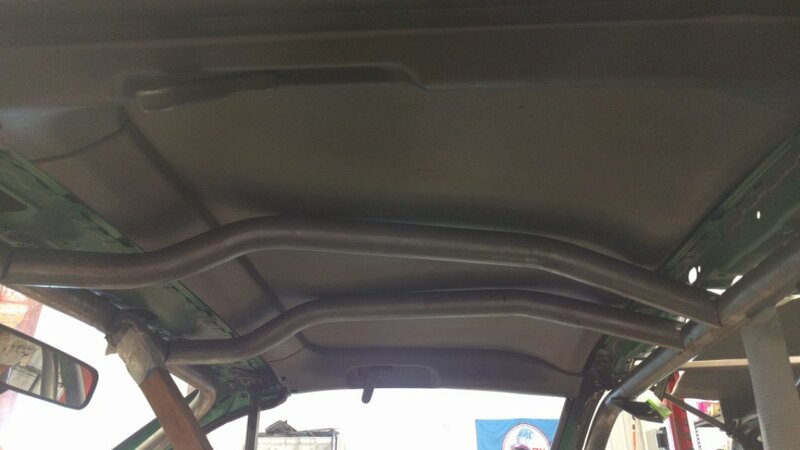 Lightweight aluminum targa roof. More ideal side windows for the shape of the planned doors. Easy transition from roof to rear end. Last edited by beeman; 01-19-2017 at 08:24 AM. 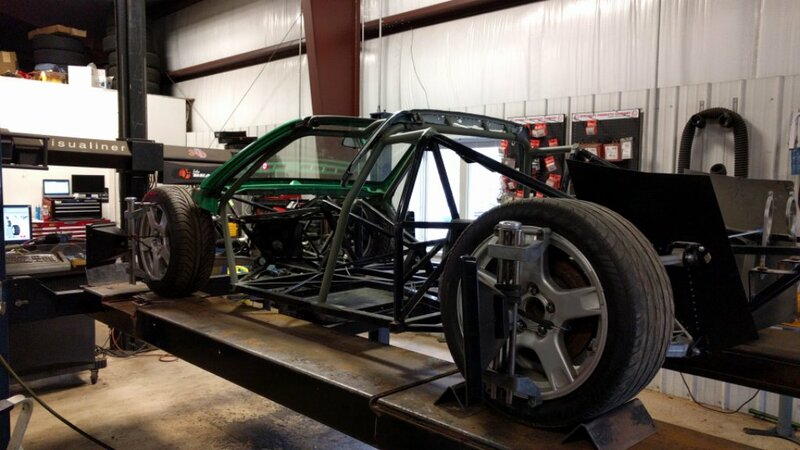 In October, had the donor parts off the donor chassis and began fitting them to the GTM chassis. I eventually would get the alignment perfect. Difference in B-pillar location, 15" forward. 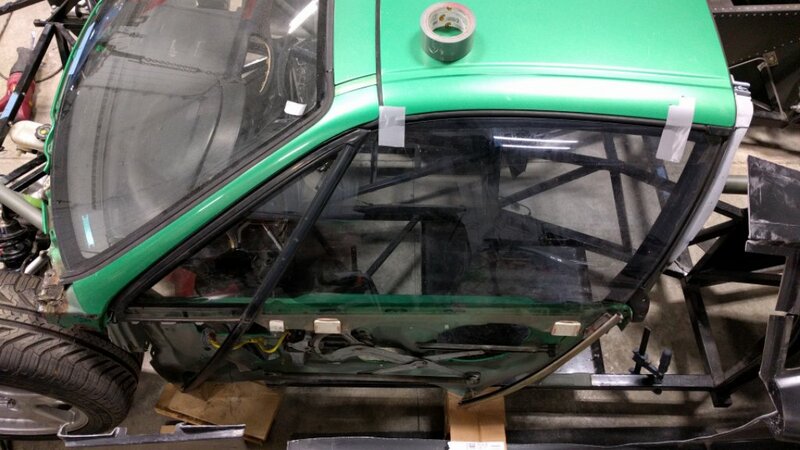 Rear bodywork is slid back to get it out of the way, pay no attention to it. 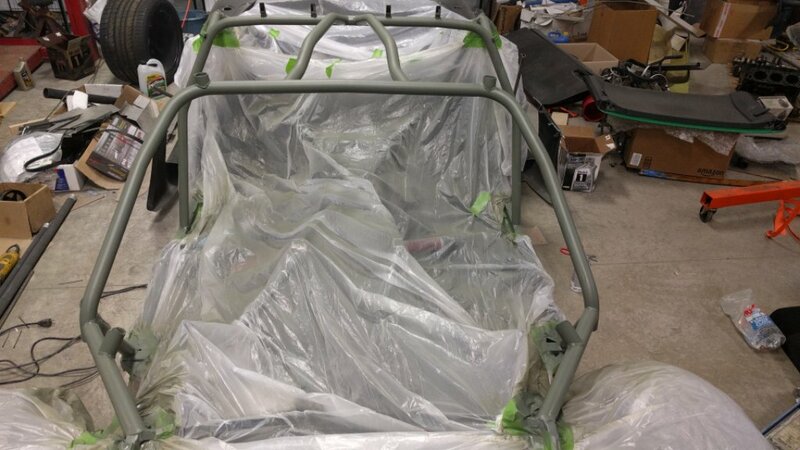 Began to build up the roll cage. Last edited by beeman; 01-19-2017 at 08:28 AM. 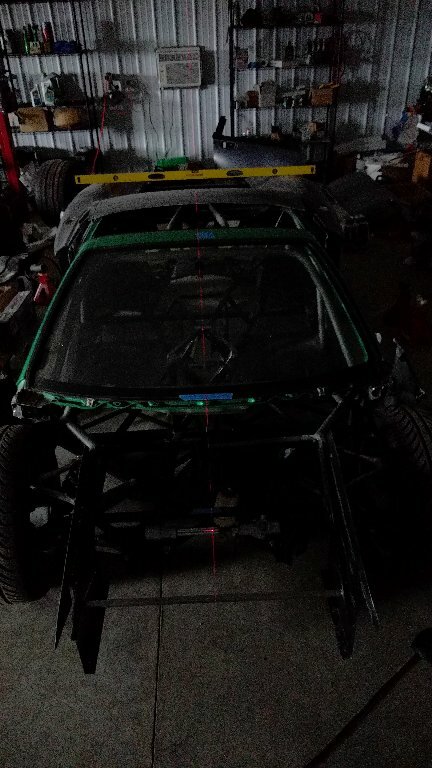 I had issues with the stock GTM roll cage being right next to the side of my head in the driving position, I'm 6'3". That really bothered me, I think my head would have exploded if I got T-boned. 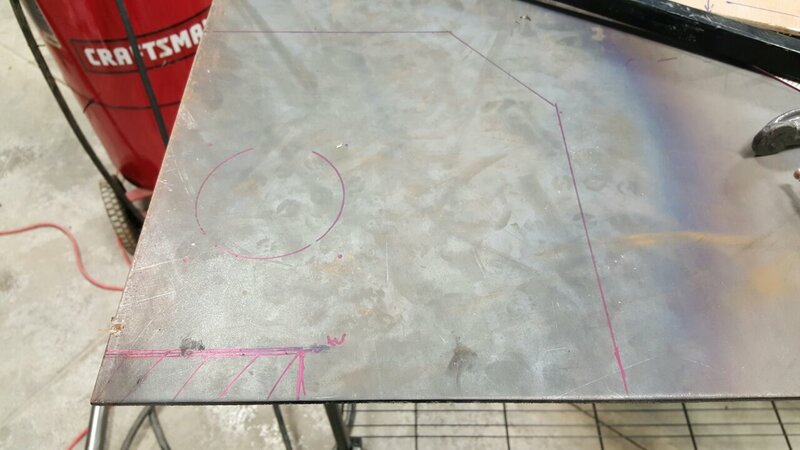 I decided to do something like the Ultima GTR roof structure. 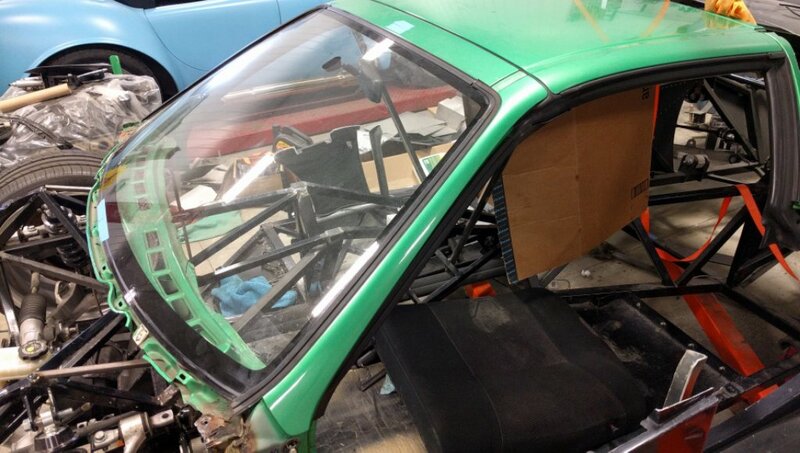 I designed the upper bars to curve up into the targa top recess for even more headroom. 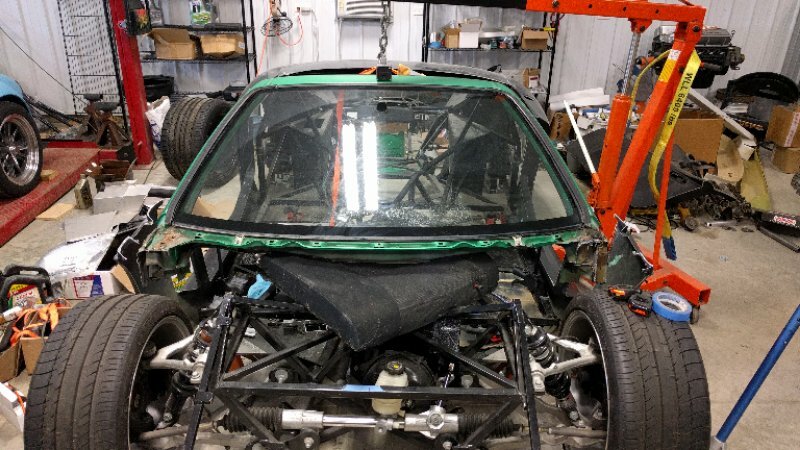 In driving position, I don't believe there is any way - even trying - for my head (even with a helmet) to hit the roll cage. 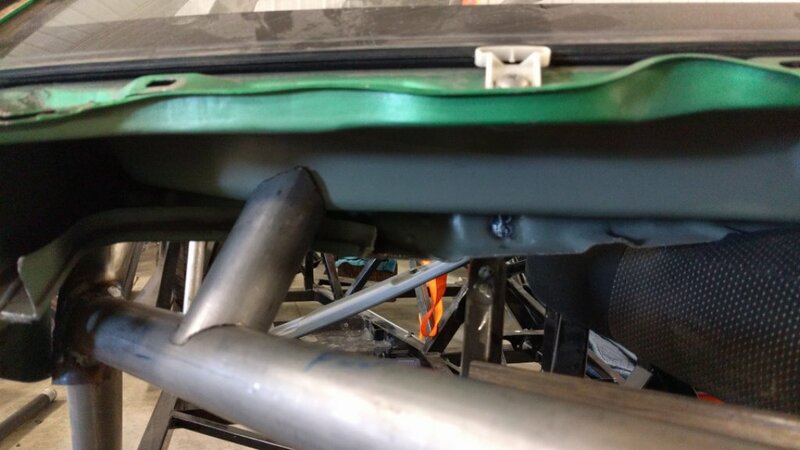 After building the cage from DOM tubing, I prepared the chassis with tack welds to be delivered to a fabrication shop for safe welding of the structure. 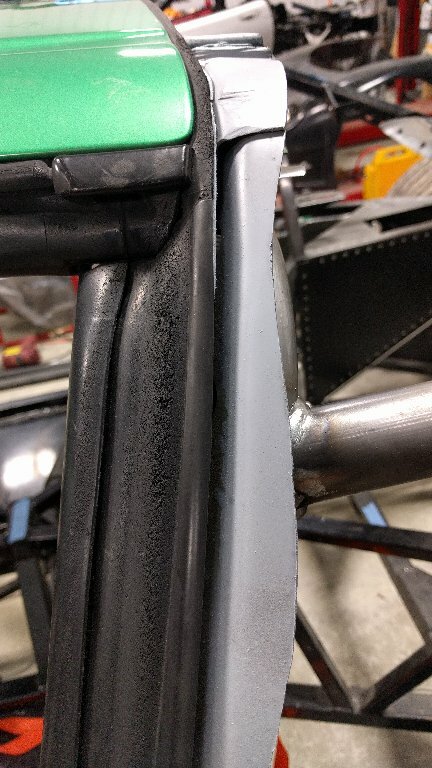 The shop I used builds and races tube frame Mustangs. Additional triangulation is planned for the future. Last edited by beeman; 01-19-2017 at 11:57 AM. 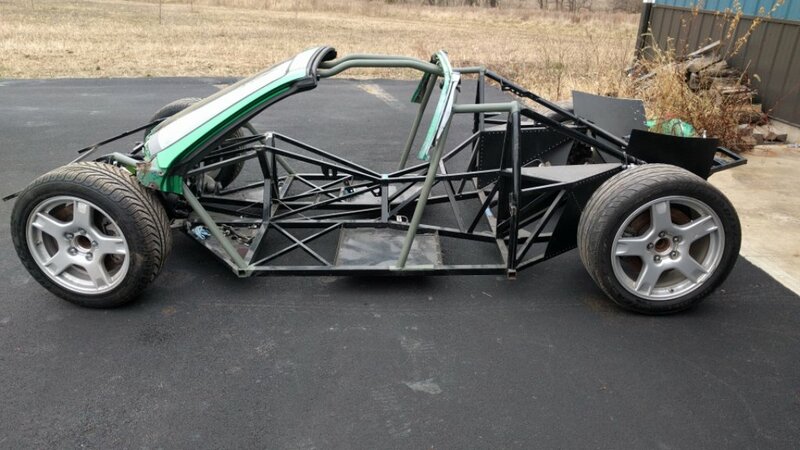 Dropped the chassis off at the fabricator the week before Christmas, got it back the week after Christmas. 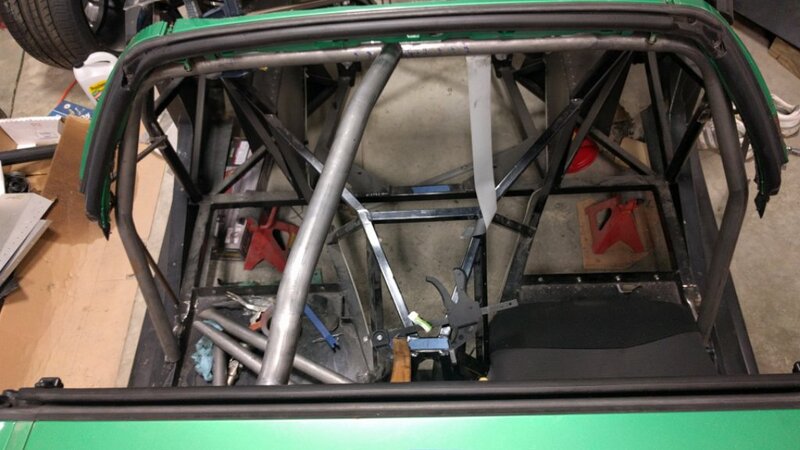 Made little pieces of the puzzle with the chop saw/notcher/grinder to tie donor parts into the roll cage. A little tedious but I love this crap. 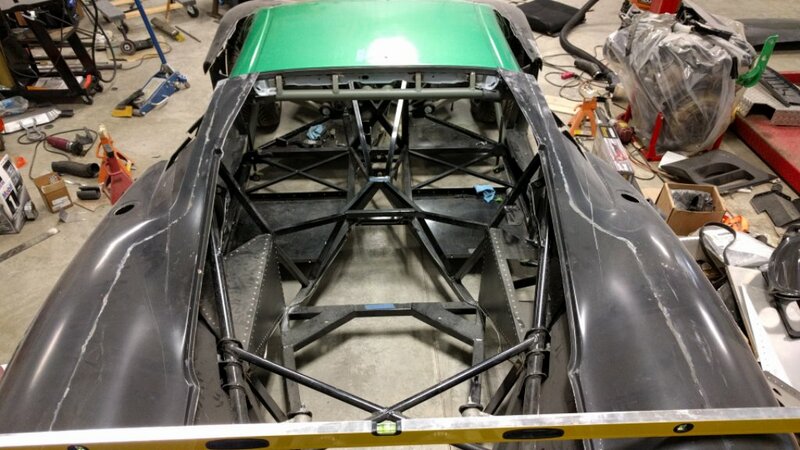 One challenge was tying the rear GTM bodywork into the donor cabin structure. Decided to hinge the rear hatch at the level of the back edge of the targa seal. 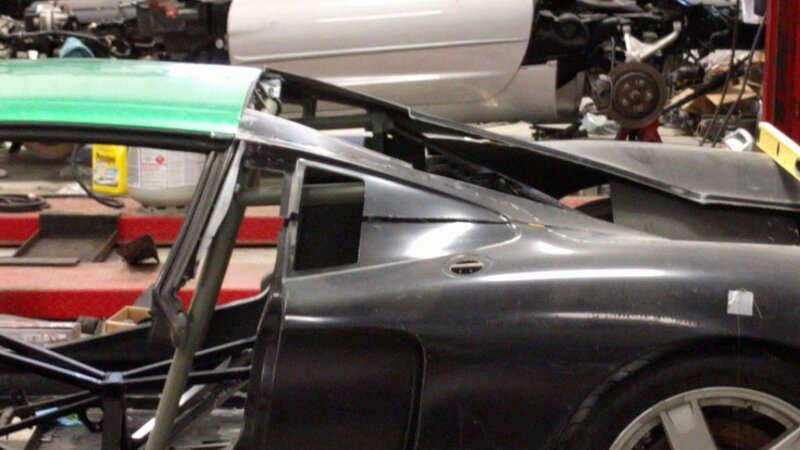 All metal bodywork has been removed from the rear and sides of the b-pillar structure, deep unibody left on sides to tie the side/rear GTM fiberglass into. Last edited by beeman; 01-19-2017 at 11:55 AM. Love it, this is one heck of project! a lot of people have made GTM's with their own style but this will hopefully push creativity for future builders. Cant wait to see how close it ends up to your rendering. 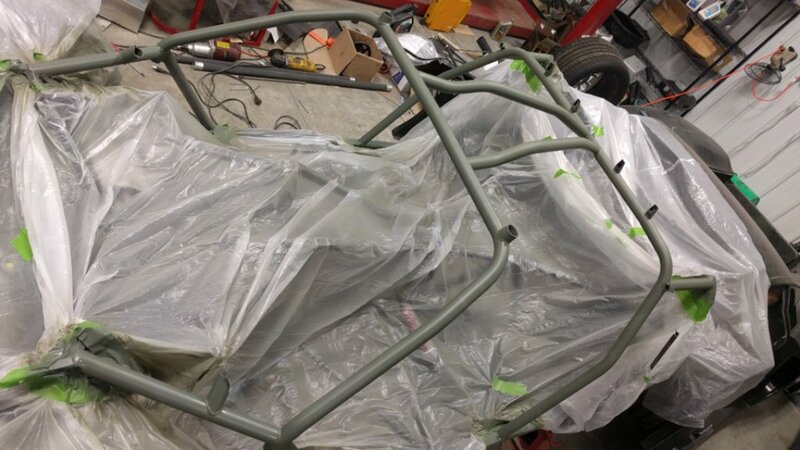 Here is the welded chassis after an etch prime, you can see the body tie-ins for the windshield and roof structures. Donor parts welded on for good. Last edited by beeman; 01-19-2017 at 11:28 AM. This will be fun to follow. Took her in for an initial alignment. 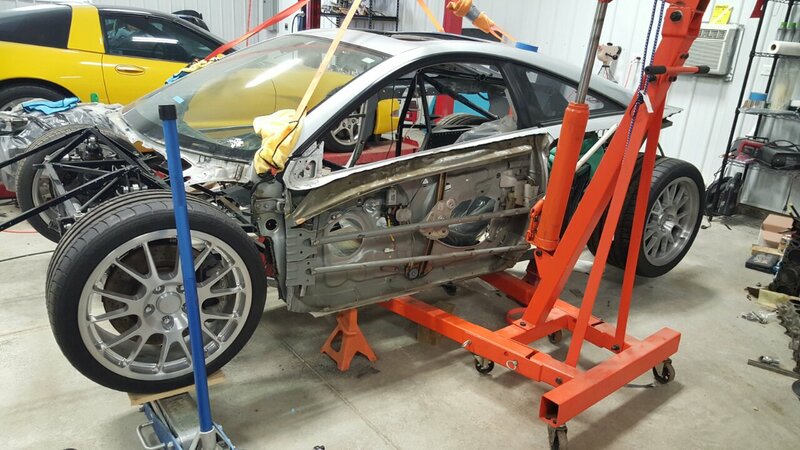 Didn't want to touch the body work until I knew where the wheels should be. No brakes yet. 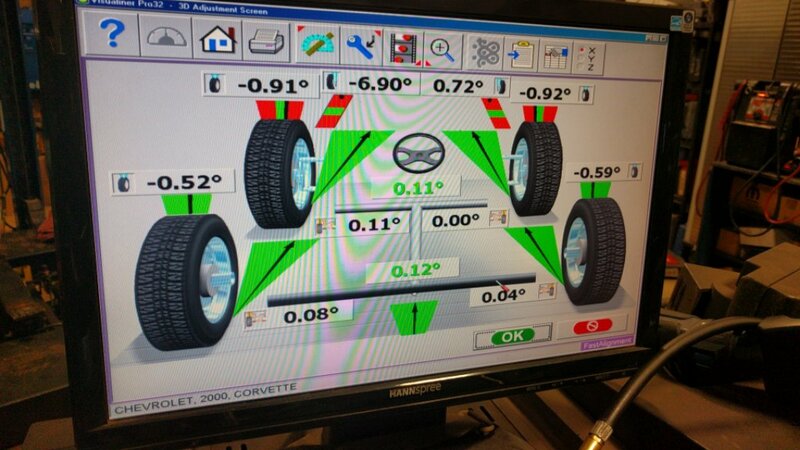 Couldn't get an accurate caster reading without ability to lock the front brakes! 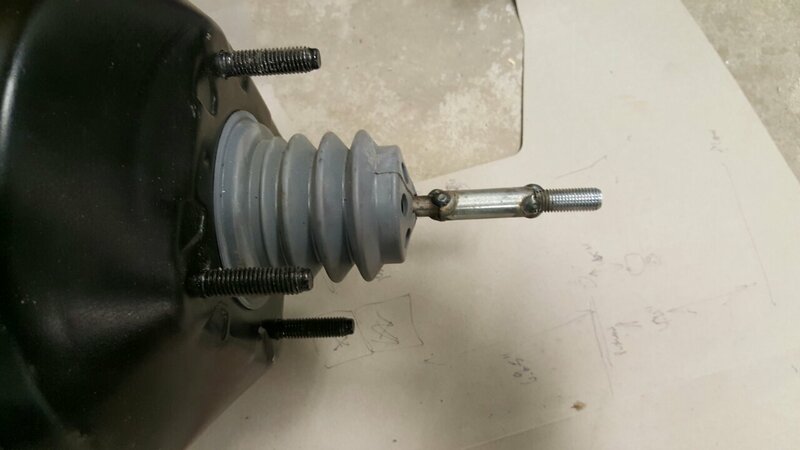 So we went with the maximum caster that the components allowed, will have to recheck that in the future. I like the stance, about 4.5" front, 5 1/8" rear. May play with that a little when completed. Nice to be moving forward, I missed my clecos! Basic shape is there, I'm thinking she has some potential! I like the flow of the roofline into the rear end. As you can see, there isn't a huge difference in roof height compared to standard GTM. 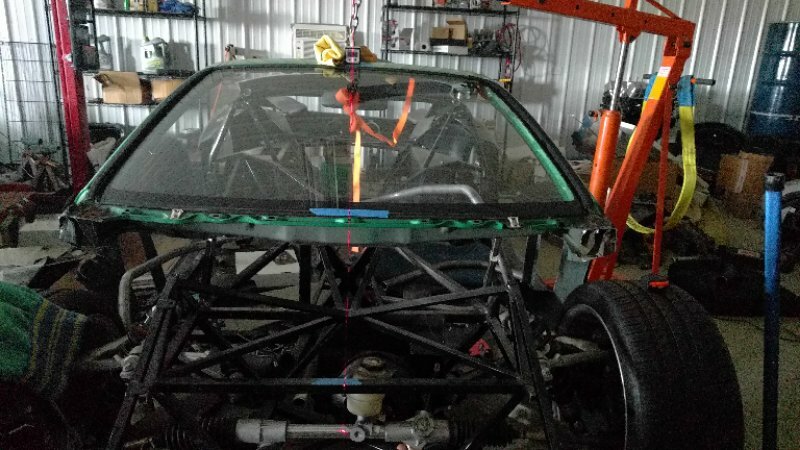 A most ambitious project for sure.. What winshield Glass and targa top donor did you end up with ? Yep, Del Sol it is. Featherweight, aluminum roof, narrow cockpit. Cabin tilted back about 2 degrees compared to stock del sol. I wish all your photos were showing up. Many just show as a X (at least for me). Just listened to the Trump inauguration. Finally a real leader in Washington! Working on the interior.. Not quite plug and play! Nothing is off the table, this may help me with shrinking the front end. I will probably modify the intakes if it is incorporated. Last edited by beeman; 01-20-2017 at 12:26 PM. What's the nose from? 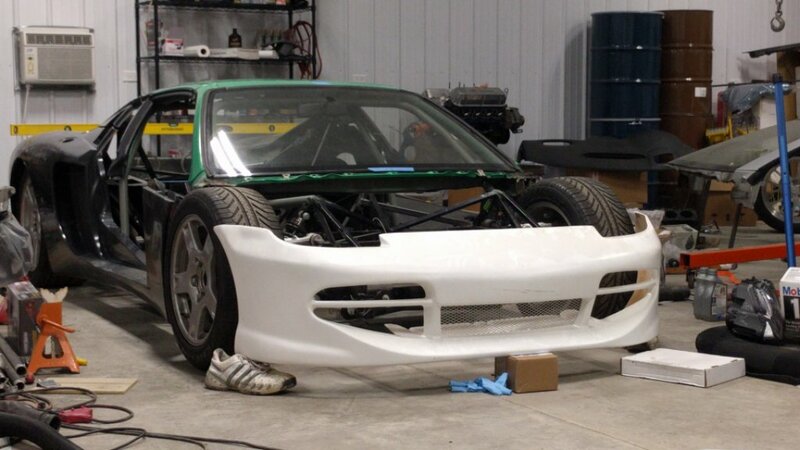 Almost looks RX-7ish? A little tall maybe for that. 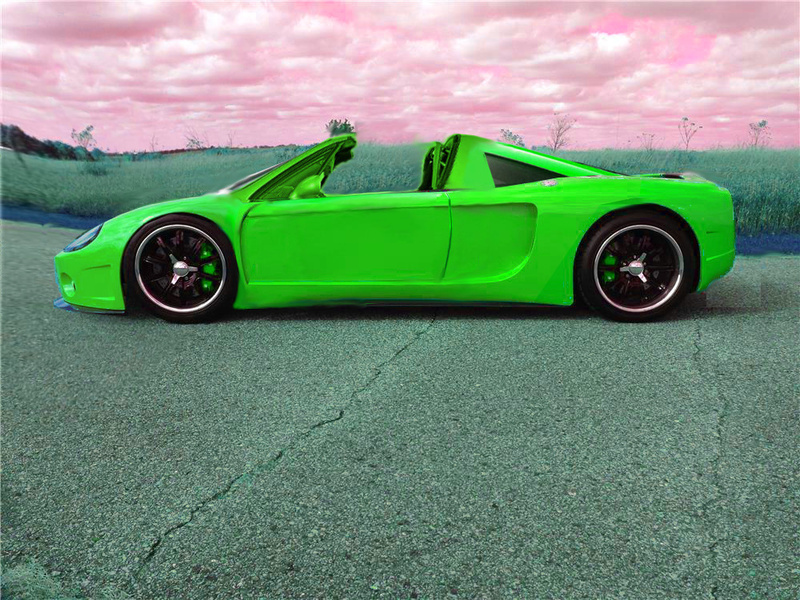 Actually MR2 spyder. About 6" shorter than GTM fascia believe it or not. I understand the GTM design harks back to the original GT40, so I understand the long nose. Just looking for something different. Goal is not just appearance, but also better forward visibility. Key goal all along has been forward visibility. I have achieved this. 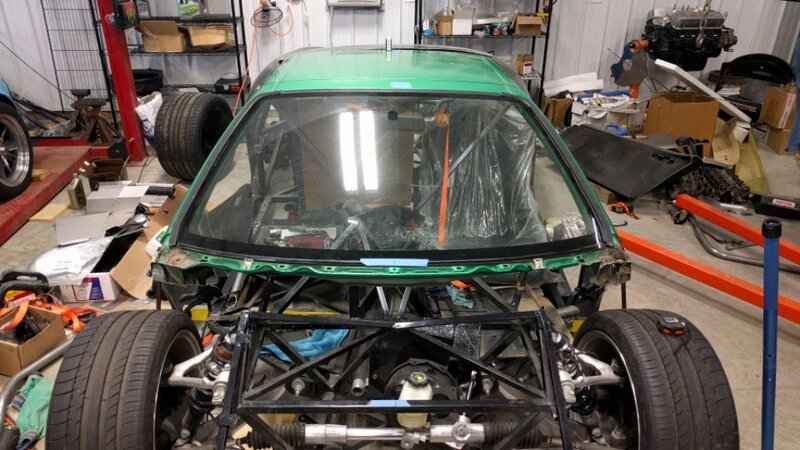 You can see where the tires are, will obviously have fenders above them, but central hood will remain low and sloping. 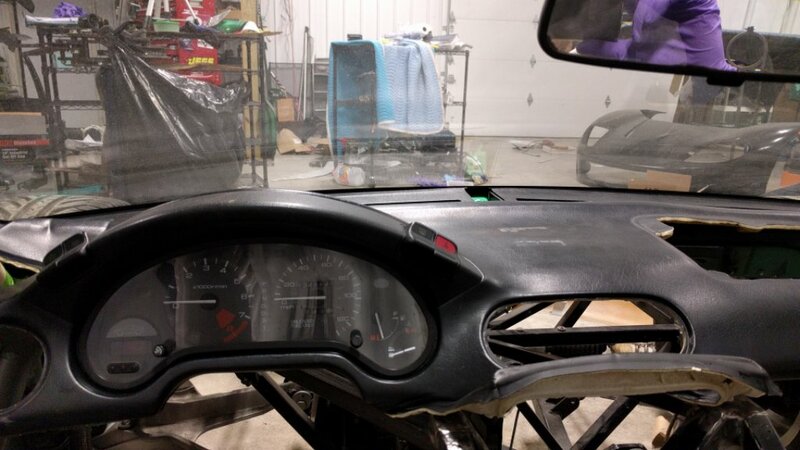 Gauge cluster will reside in same housing with different gauges and indicators. Last edited by beeman; 01-20-2017 at 01:01 PM. 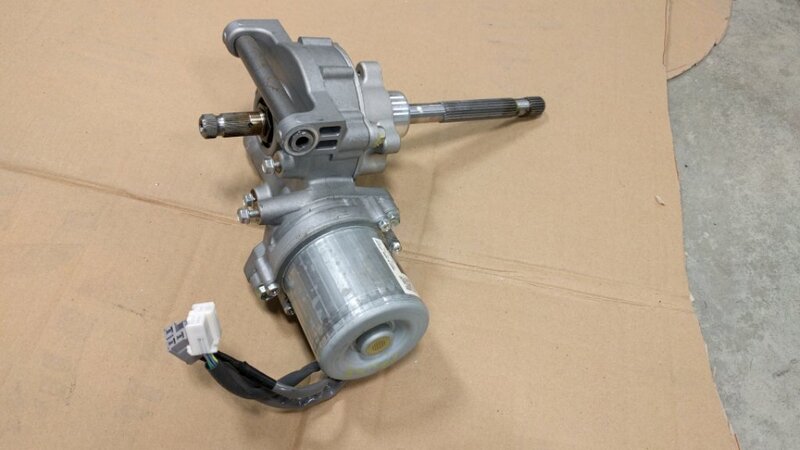 Those electric PS units, while fine for street applications, tend to have overheating issues on the race track. Just a heads up. I had not heard that... Is that even with the assist dialed way down? I plan to track it 2-3 times a year for high-performance driving, not wheel-to-wheel.. it is the GM unit from The Vue / torrent. I would have the ability to turn it completely off without much increased resistance if that would help protect it on the track. 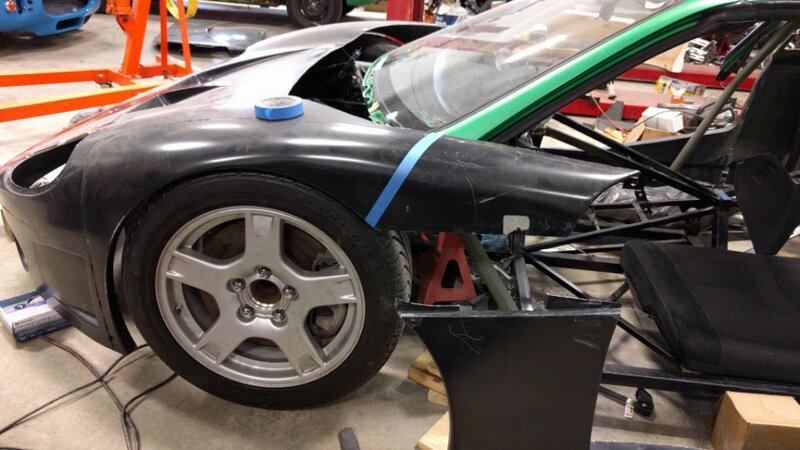 My experiences are with two competitors that had them and both experienced issues that made the cars undrivable. They put cooling fins and dedicated air cooling ducts to them and the issues seemed to go away, but I thought I would mention it as a heads up. From talking to them it sounds like something gets hot, expands, and then locks the steering. Not fun at speed. I think they were using the Unisteer and/or the Flaming River units. Unrelated update, got my roadster back from the painter this morning, I absolutely love it!! And right on budget (plus a nice tip of course)! This GTM is the best build I've seen here - well done. 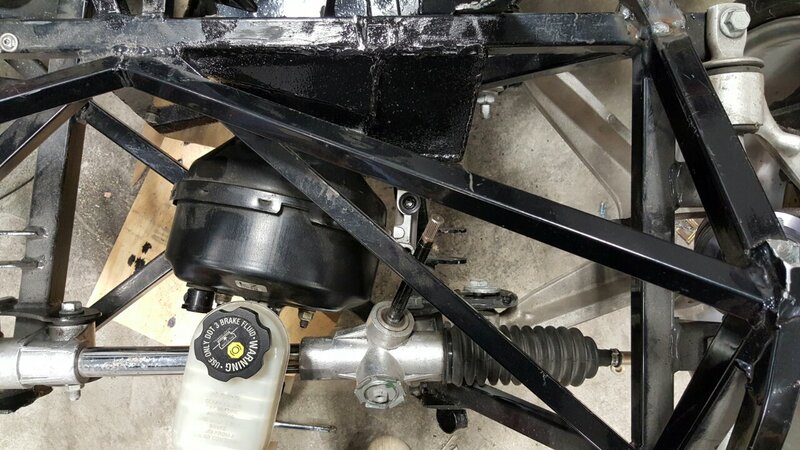 I've done some wacky things like this in the past - round tube frame under a 'glass 55 chevy with 383 sbc - I love the one-off's where you're making it how you like it. BTW, the roofline/glass of the GTM is the only reason I don't like it - this is MUCH prettier imo. Very impressed. 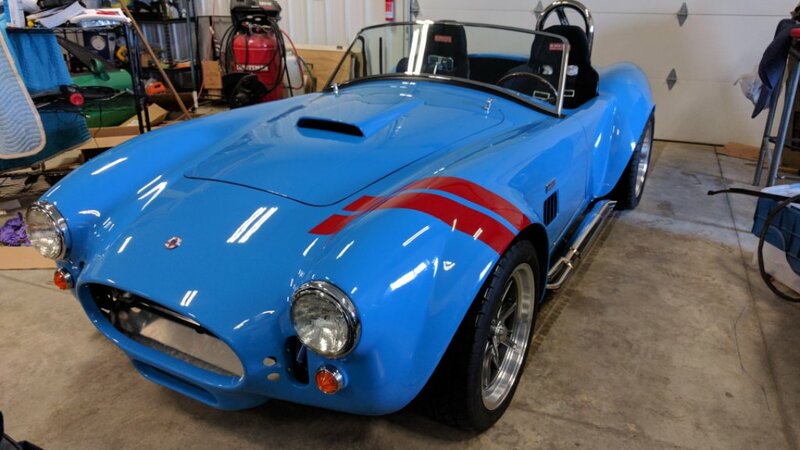 Classy color choices on the Roadster Beeman! I like the roadster color choices! The GTM is amazing! Mad skills to be sure!! I have deep respect for those that have the vision and skills to do work like you are doing. I look forward to following along; awesome stuff!! Appreciate the kind words, guys! 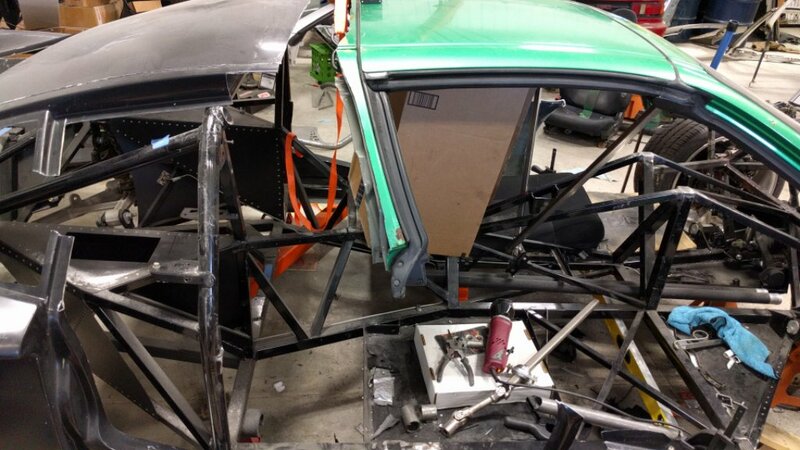 Here is where this donor chassis is really cooperative. The split side window gives me critical emptiness in the forward/lower door to allow for me to push the cab way forward. Most cars have window tracks that extend all the way down to the lower front corner of the door. Big reason I abandoned the other 2 chassis. Love the squeaky tight seal so far! Last edited by beeman; 01-22-2017 at 04:28 PM. Airtight side windows and cabin... It's glorious! I've been looking at many options for hinging the door. 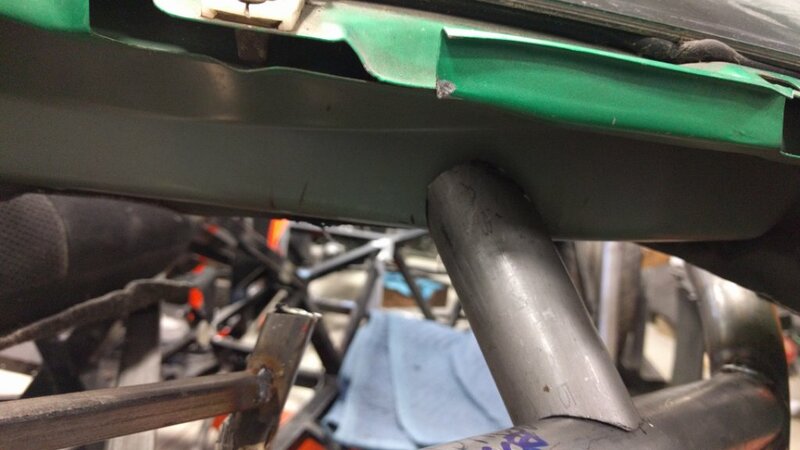 Standard front hinges are not an option obviously, I'd have to mount them to the front wheel. 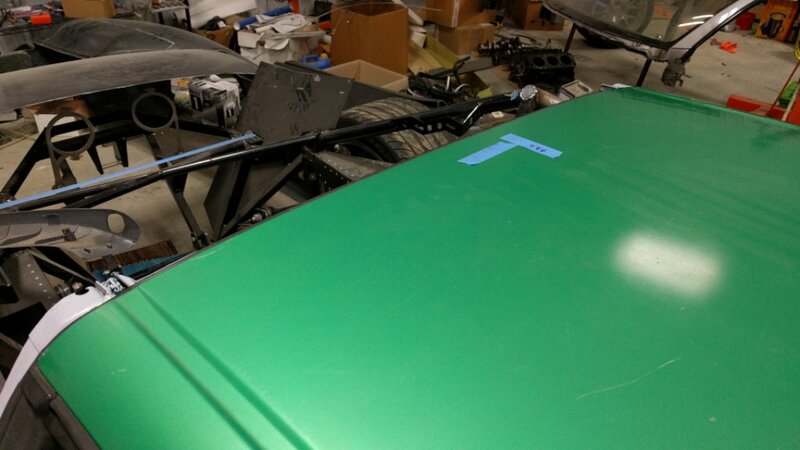 Universal Lambo door hinges also reside in the typical front fender area. My best options would be butterfly style hinges vs suicide hinges, and I'm not really interested in suicide doors. 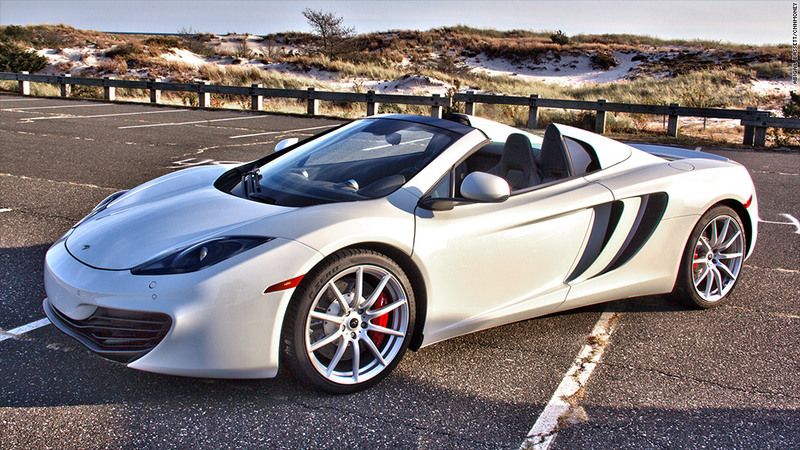 I have looked at OEM options including McLaren. They are a little complex but do-able, and tuck under the base of the A-pillar essentially. 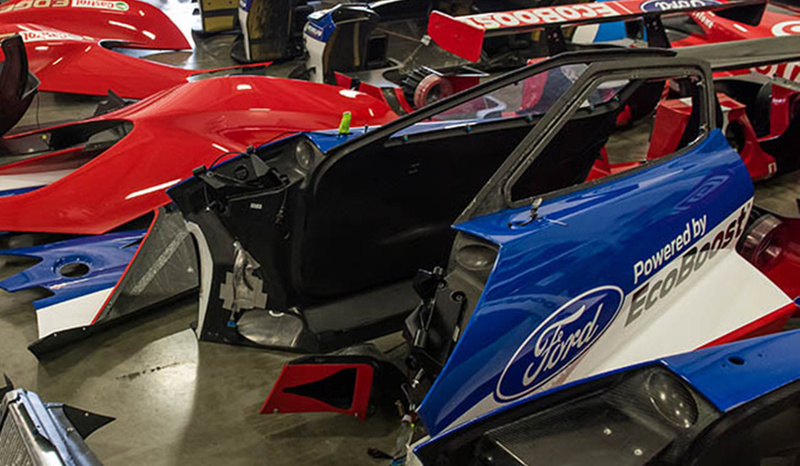 One option I recently stumbled upon are the hinges on the Le Mans Ford GT. Certainly not something you'd find on a high $$ factory car, I'm pretty sure the factory Ford GT does not have these simple hinges. But they are perfect for a car like mine. And I actually like the simple, utilitarian design. It should be as simple as getting the geometry right, the axis of the hinge appears to be just out of line with the slope of the A-pillar. 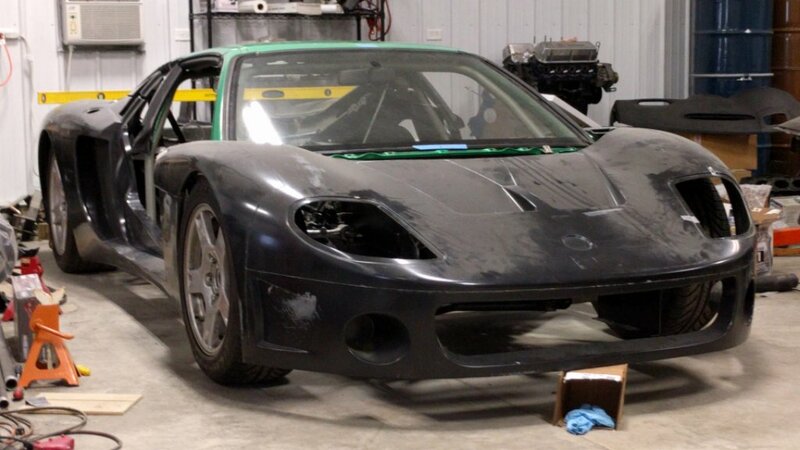 The Ford GT design looks like it slides on and off with a couple retaining pins. 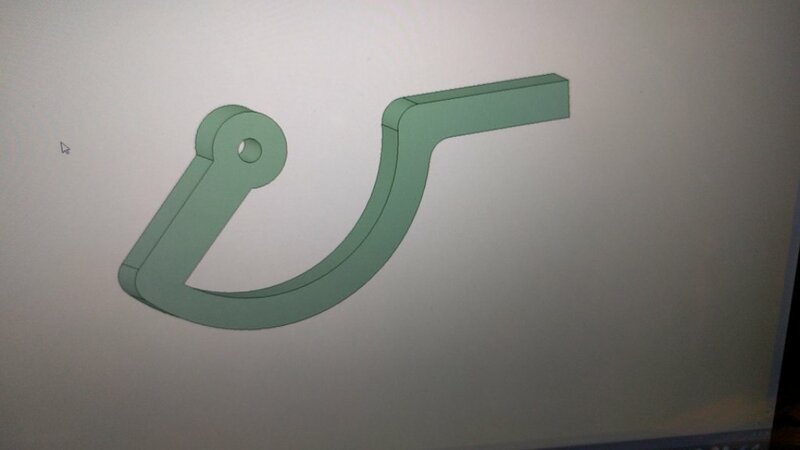 Let me know if you guys have any ideas for the hinge interface, I don't even think there are bearings on this design? All you need is two points in a relative straight line. Then use rod ends to take up any minor alignment issues. 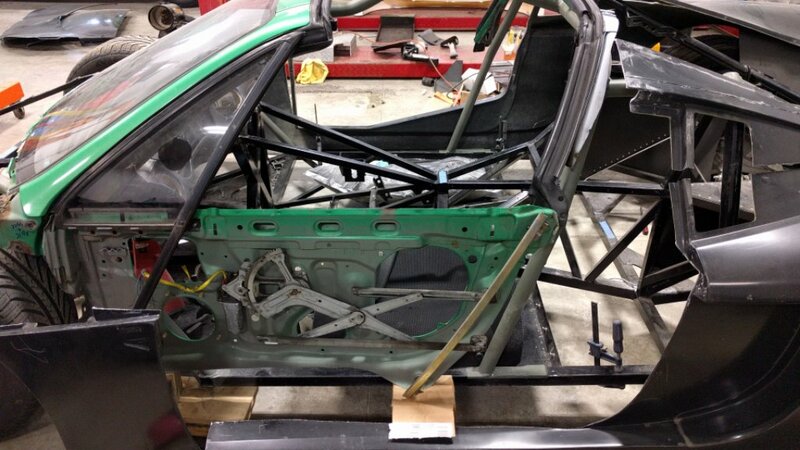 This is what we did on the FFR PDG GTM race car. 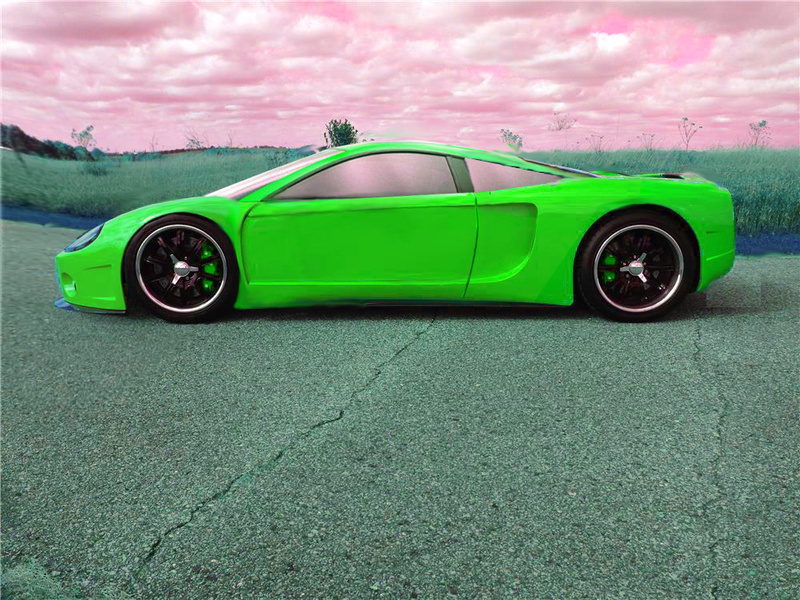 You can also put them inside the car, which is what I am doing on the GTMR. I appreciate that tip, Crash. The rod ends are smart, I might have to borrow that idea. Do you get much up/down wobble with them? I'm guessing the tolerances are tight enough that it isn't an issue. With the door open, how much up/down play do you have? 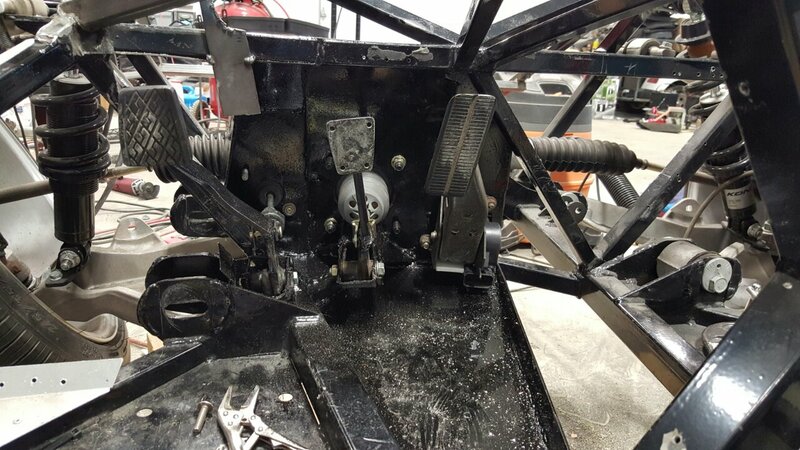 Each of my donor chassis doors had alignment guides below the latch that help get the alignment perfect as the door latch comes into the striker, basically to remove any minor play in the hinge. I procured them for my build. I think they are a great way to ensure a straight door closure. Del Sol's have them, not sure about other cars. Here's a pic of the door, you can see the male part of the guide on the lower door. Last edited by beeman; 01-23-2017 at 03:27 PM. 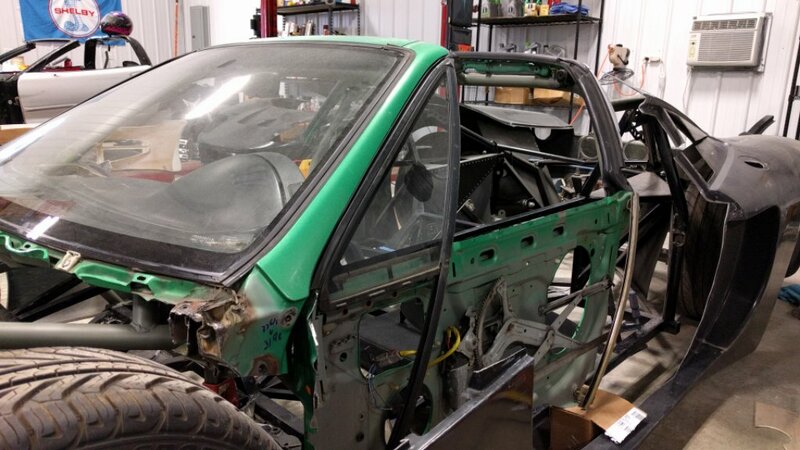 Making the doors half doors because we have fuel cells on the lower areas of the doors, it necessitated that we remove the inner parts of the doors. 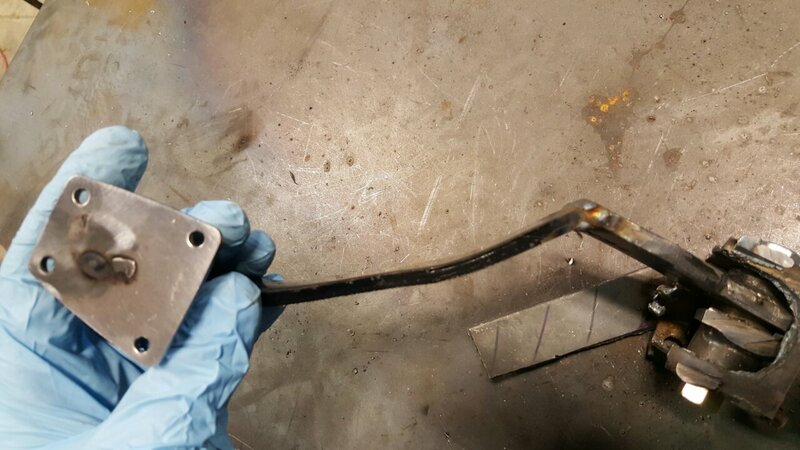 Therefore we were left with just a door "sheet" so we made a 3/4" steel door frame to regain some rigidity. The biggest issue we have had is with getting the door to align the striker consistently. It isn't really a problem if you adjust just to close from the outside, or just to close from the inside, but to get the doors to do both is a bit of a challenge. While the rod ends are slightly lose when the door is open, they are such that they snug up when the door is latched. 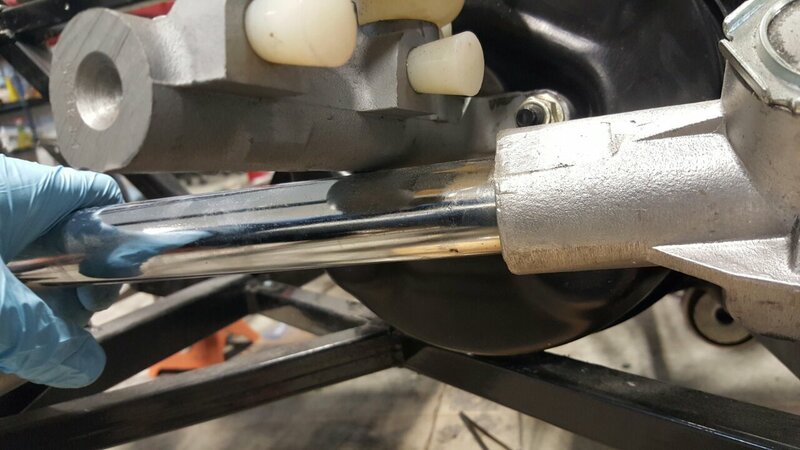 Using nylocks on the rod end through bolts allows for that adjustment as well. Rigidity probably won't be an issue for you. Lifting the door, OTOH will be. We use gas shocks so all we have to do is hit the latch lever and the door "pops" open. 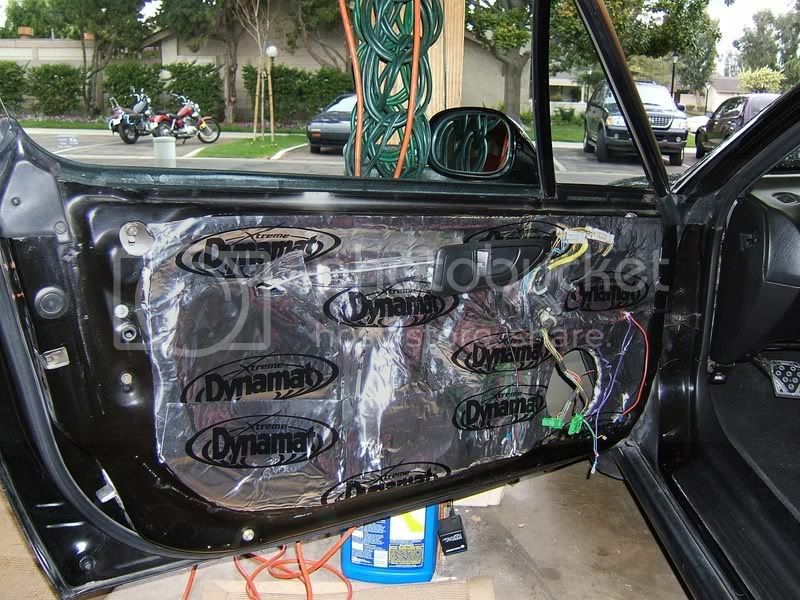 I would suggest something like this for your setup as your door will be pretty heavy with all that glass and steel. Last edited by crash; 01-23-2017 at 04:02 PM. Yeah I'll definitely use a gas shock to bring the door up. Donor door is about 65-70 pounds fresh off the car as I recall (that is light by OEM standards). I'm probably at about 30 lbs with glass right now, I'll weigh it. Goal will be around 35 pounds or so. 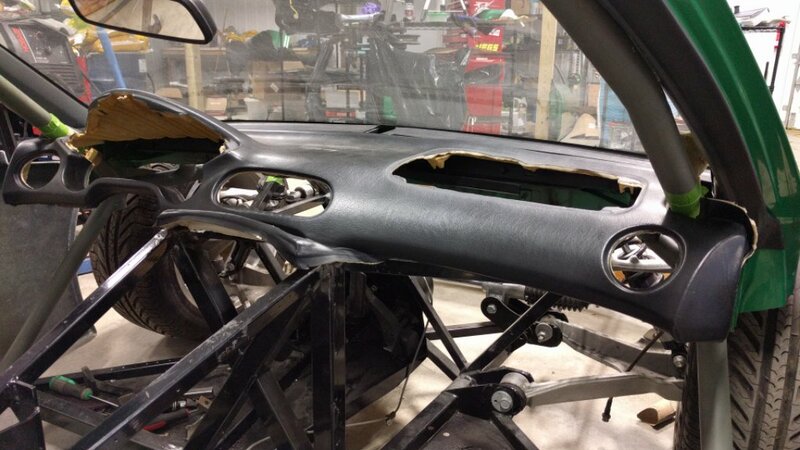 OEM doors are so freaking heavy, but they contain collision protection bars, in addition to a lot of structural and cosmetic steel. 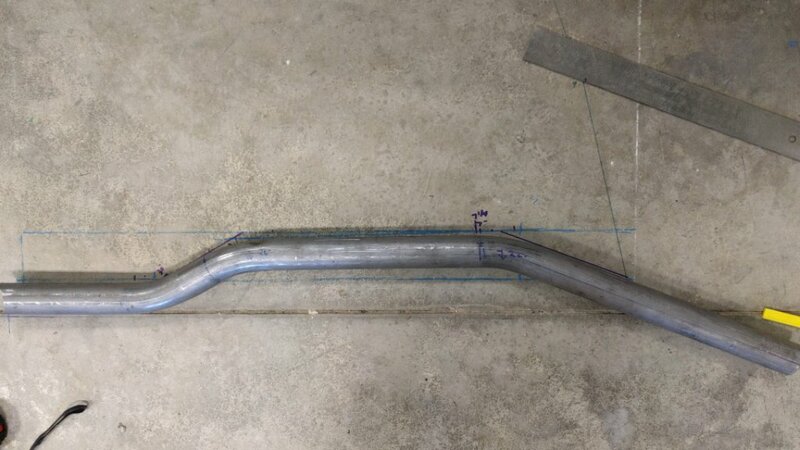 My door bars will be part of the frame and won't have to open/close. Going to try a constant radius OEM style hinge just for fun. This would tuck under the a-pillar when closed and travel nicely through a cosmetic slot. Drew something up in CAD, will print it out and see how it functions. 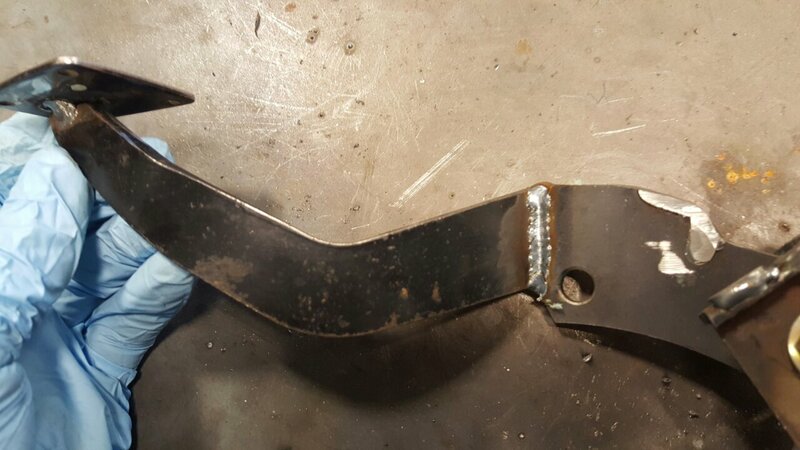 Actual hinge would be thicker, this is just a quick mockup for proof of concept. 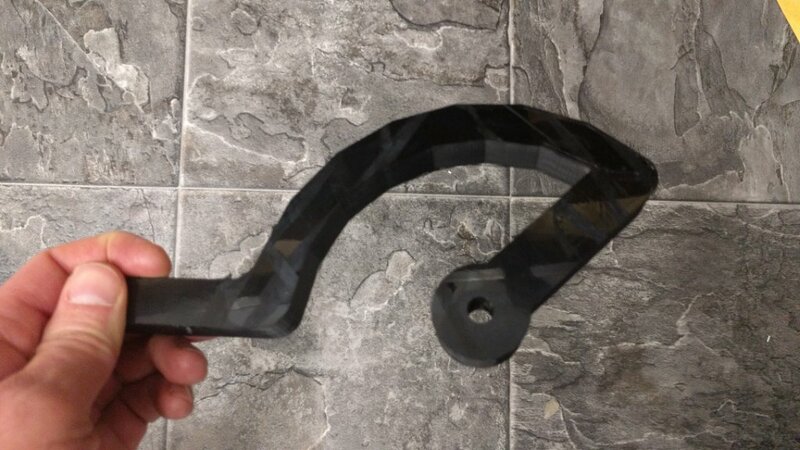 So the actual hinge would be something more like this, just takes a lot longer to print and uses a lot more filament. I'm just curious about functionality at this point..
Last edited by beeman; 01-24-2017 at 05:58 PM. This is one of the best things I've seen on the board to date. Carry on! Weighed the door without the side window in, 18.8lbs. 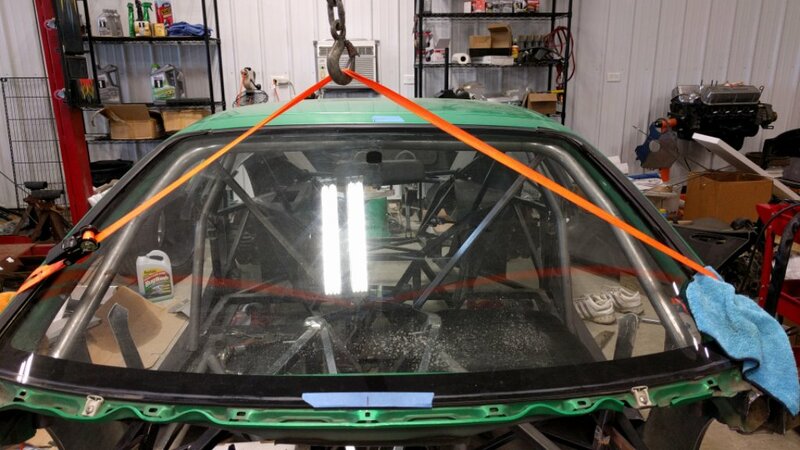 Getting ready to cut the hood to move the rear part of the hood onto the door, planned cut is similar to other butterfly door parting lines. Need to verify axis of hinge rotation first. 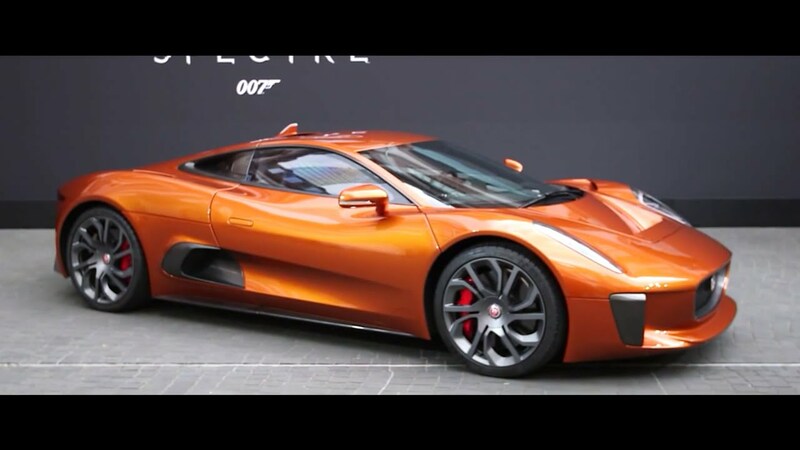 Leaning towards borrowing ideas from the Jaguar. Last edited by beeman; 01-27-2017 at 01:02 PM.